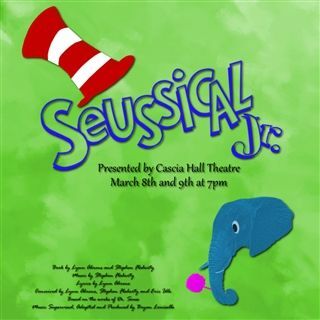 Cascia Hall Preparatory School | Seussical, Jr.
Based on “Horton Hears a Who,” and filled with beloved Dr. Seuss characters including the Cat in the Hat and Thing 1&2, Seussical Jr is an adventure that spans oceans, deserts, and demonstrates that “a person’s a person, no matter how small!” Come meet Jojo and her family of Whos, the gentle giant, Horton, Gertrude with her one feather tail, the Sour Kangaroo, and the irresponsible, inadvertent villainess, Amayzing Mayzie, as they deal with the plights of an egg and an entire town too small to see! Will Horton be able to convince the residents of the jungle of Nool that he isn’t crazy? Come find out as our middle school cast presents this lively and heartwarming show! CASCIA STUDENTS attend for FREE.